A constellation of beautiful stars and moons: pendants and earrings made from upcycled tins and aluminium remnants finished with twinkling Swarovski crystals. 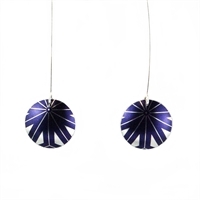 Brushed luminous silver and gold and matt velvety black are combined with rich amethyst starbursts and geometric patterns reflecting the deep Midwinter night sky. The addition of Swarovski crystals to some pieces add a touch of sparkle to our new Stellar collection. 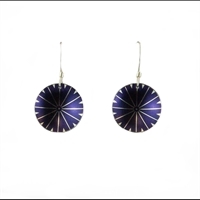 Perfect for gifting or an addition to your jewellery rotation. 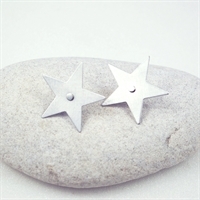 Moon studs handmade from our collection of biscuit, sweet and toffee tins. 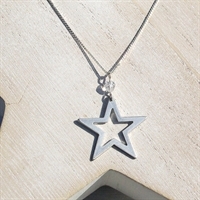 Star silhouette pendant on a 18" sterling silver chain. Available in different colours. 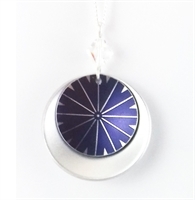 Star silhouette pendant finished with a Swarovski crystal. Available in different colours. 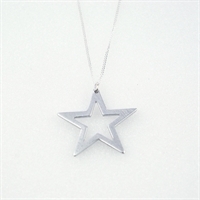 A petite star necklace handmade in recycled aluminium - available in different colours.